The necessity of accurate placement of the required quantity of nutritious elements concerning root system of plants presupposes intra soil layer-by-layer introduction of the differentiated doses of fertilizers on different depths. Meanwhile, phosphoric fertilizers have to be located in a horizontal tape closer to seeds in the moist layer of the soil, the centers of nitrogen fertilizers should be at different depths that will allow roots of plants to get necessary mineral nutrition during different vegetative periods. For providing adequate nutrition of plants during the whole vegetative period a new technology of the intra soil differentiated three-layer introduction of mineral fertilizers is offered and its constructive and technological scheme is substantiated. A probabilistic method is studied for determining the required number of spare components to maintain the efficiency of the fleet of machines using the characteristic of the flow of refusals Analyzed the influence of the parameters of the laws of distribution of work off failure (resource) of elements on the parameters and characteristics of the stream of refusals for recurrent stream late and for general stream of refusals and identify areas of their influence. It was found that with an increase in the quality of new and recovered items (the assemblies and parts) increases the level of reliability of the plant and reducing the cost of replacement parts. The objective of this study was to compare the effects of previous crop residue (wheat vs. lentil), tillage (reduced tillage vs. no-tillage) and nitrogen source (rhizobial inoculant and fertilizer-N application) on nodul formation, dry matter accumulation and seed yield of double crop soybean. The experiment was laid out as split-split plot with three replications. According to results obtained from the study, previous crop residue affected seed yield, and seed yield after cultivation of lentil was higher than after wheat. Nodul nitrogen content decreased at the reduced tillage, while nodule dry matter and seed yield increased compared to no-tillage system. Rhizobium inoculation alone produced the highest seed yield. However, the addition of N-fertilizer to inoculated soybean did not improve seed yields when compared with inoculated only treatment. This research demonstrates that applying rhizobium inoculation in no-tillage system under lentil residue has the potential in increase nodulation and seed yield of soybean grown double-cropping system. 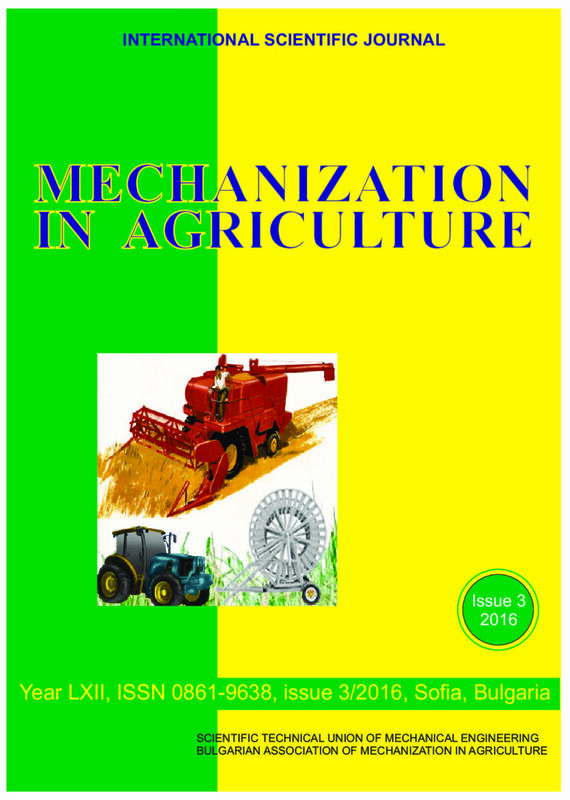 The article presents the results of experimental studies of the soil tillage unit based on a new modular power machine of variable traction class. It includes the universal tractor of drawbar category 1.4 (2.0) and technological unit as an additional bridge, having active drive wheels from synchronous PTO-shaft of the tractor. The new modular power facility with experienced five-part plow has been investigated in wheat stubble plowing. Obtained operational and technological parameters are compared with the same regulatory parameters of the tillage unit as part of a tractor of class 1,4 and a three-part plow. It is found that the performance of a new replaceable unit is 1.9 times higher and the specific fuel consumption is 27.5% less in comparison with the standard unit. Special laboratory and field experimental studies established the degree of influence of the wheels on the process of compaction of different initial moisture content (12.8…20.8%) after the passage of the wheels of the front and rear axles of the tractor of class 1,4. Aim of the paper was to compare the effects of two very similar fertilisers on nitrous oxide (N2O) flux from soil to the atmosphere in laboratory conditions. There were used following fertilisers: granulated nitrogenous fertiliser DASA® 26/13 with content of nitrogen is 26 %, content of sulphur is 13 %, and nitrogen fertiliser ENSIN® containing sulphur and nitrification inhibitors dicyandiamide DCD and 1,2,4- triazole (TZ). Both fertilisers are produced by the same manufacturer DUSLO, Inc., Šala, Slovakia. For both fertilisers there were carried -1 out three variants of experiments for equivalent of application rates 0, 250 and 500 kg.ha . The amount of N2O emissions released from soil to the atmosphere was measured by photo-acoustic field gas monitor INNOVA 1412 connected to multipoint sampler INNOVA 1309. The experiments were conducted for 30 days in laboratory conditions. The fertiliser was incorporated into the soil in sampling tubes to a depth of 80 mm after 24-hours measurement. Subsequently, after every 24 hours of measurement, another 48 hours was carried out, and this measuring cycle was repeated 10 times. The results of our experiment have confirmed that the fertiliser application rate and type of used fertiliser have a significant effect on N2O flux and have confirmed the importance of accurate and uniform application of the fertilisers in field conditions in order to eliminate the negative environmental effects. The results of studies wear resistance of boron coatings alloyed with Сu, V, Nb, Cr or Ti under dry friction – slip in the air, and it was determined that the best coatings are the boride layers alloyed with copper. Alloying with copper inereases wear resistance of boride layers in 3 times. When alloying of boride layers with niobium wear resistance increases in 2,8 times, with titanium – in 2,4 times, with chromium and vanadium – in 1,5 times. Wear resistance of boride coatings alloyed with copper under dry friction – slip 14 times higher than wear resistance of bronze of Cu – Al – Mn system and wear resistance increases when applying boride layers alloyed with copper. Production of hydroponic green fodder is an important task of agriculture, which in developed countries is given enough attention. Currently, the world’s developed a considerable number of various designs installations for the production of hydroponic products, but the main working body of these installations are trays in which the cultivation of hydroponic green fodder, as one of the most simple, but fairly effective devices for seeding, cultivation and the ready products. Due to the fact that each of the trays used for these purposes is a resilient structure which is under the influence of considerable forces and bending moments, to design it requires fairly accurate preliminary and final strength calculations. The aim of this study is to develop guidelines on the calculation theory of plant trays strength for the production of hydroponic green fodder. The study used modeling techniques, higher mathematics, mechanics of materials and structures, in particular the theory of elasticity of plates and shells, as well as the methods of calculation and programming on a PC. Due to the growing trend of industrialization and the development of their pollution, recently there has been increasing attention to preventive approaches. To protect the environment, we need clear and comprehensive policies while there have been no the long-term policy and systematic approach in this sector. Based on the study of dynamic components related to each other, the behavior is perceived environmental systems. System approach pays attention to feedback to the origin and circumstances that cause stability or lack of stability of the system. This paper is the application of systems thinking to implement pest management field with regard to principle of Systems thinking in order to pave the ground for more researchers, decision-makers, experts and other persons engaged in agriculture, in order to achieve sustainable development.